Yesterday we ascended the ridge up to Petrovsky peak. It was a long day, at 1pm we reached the pre summit (4731m) where we turned back. A great training exercise, especially with a whole group in the heat! Tired from the trip, we postponed our daily report until today, a lazy rest day. 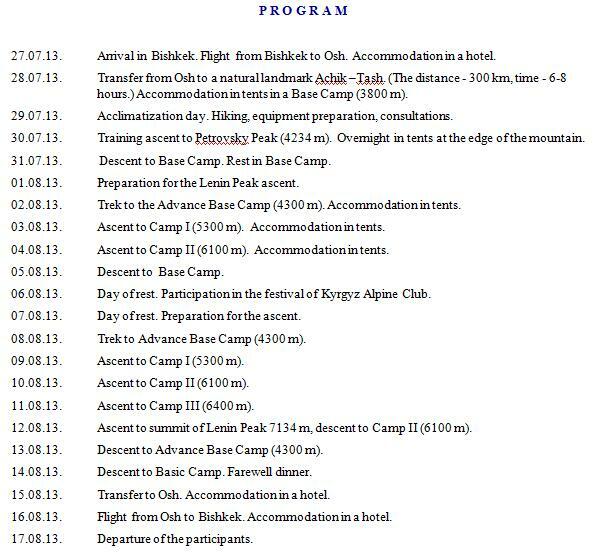 Today we’ll prepare for our acclimatization trip to Advance Base Camp (ABC), camp 1 and 2. Our luggage will be carried by horses, but from Advance Base Camp we’ll have to do it ourselves. Today we made an acclimatization trip to the pass (4100m) in the direction of the Advance Base Camp, from there we climbed to two points higher up the ridge: 4230m+4330m. Because we felt like it, we ran back to Base Camp. From higher up we discovered several small lakes, so we took a well deserved dive and enjoyed the beautiful weather. A good training day! 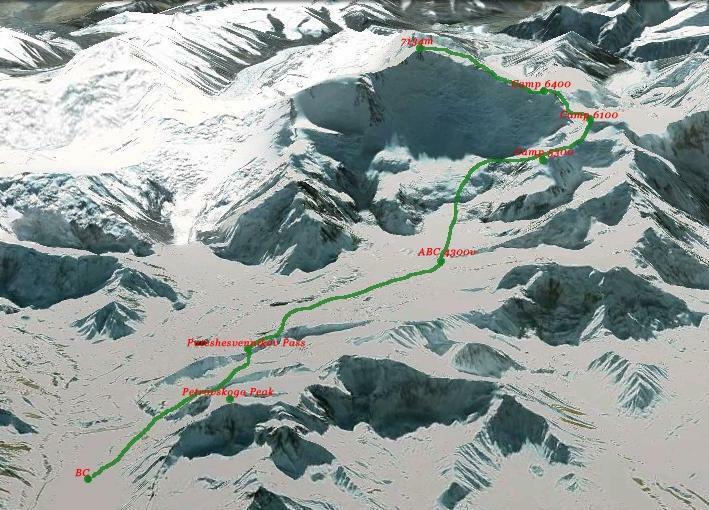 Tomorrow the training ascent to Petrovsky Peak is planned. We arrived at the base camp today. After a long and beautiful bus drive through the Kyrgyzstan steps we are now at the foot of the Lenin Peak. 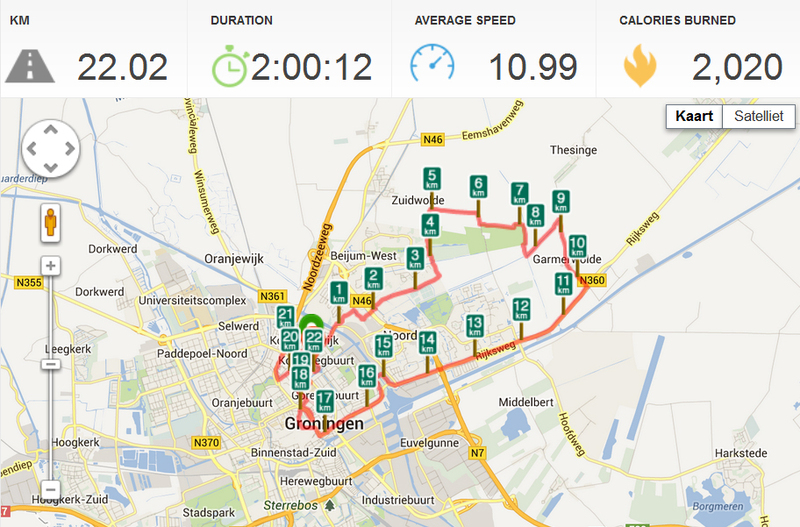 Despite the overheated engine we enjoyed our journey very much! With large two man tents and a huge mess tent it’s unexpectedly comfortable here. Tomorrow we will do an acclimatization hike, our first activity with the whole group! Thursday I (Thijmen) landed safe en sound in Istanbul. After taking the bus for 1 hour I arrived at Taksim, it was really quiet so no worries about joining the locals in their protests! What followed was a non stop tour in the old city: Sultanahmet. I visited the blue mosk, Aya sofya, Topkapi Palace, Basilica Cistern, three musea and walked around some other sites. Magnificent! Saturday is upon us, the day to start the International Youth Expedition LENIN PEAK 2013. In this agenda you can see the exact daily activity. We will try to post a message every day to share the adventure with you. There it is, a big box covered in Outdorado tape waiting for me at the top of the stairs. Although I know exactly whats in it, I want to open it immediately. New stuff! 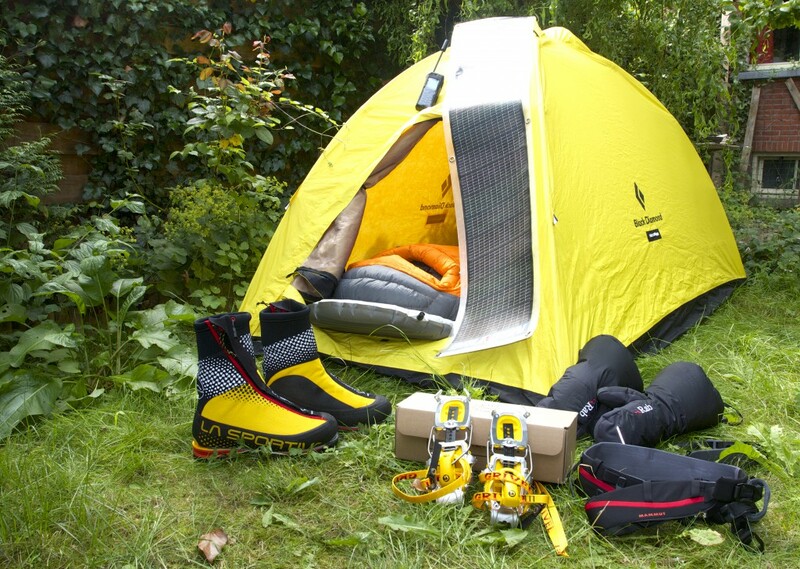 From our partner Outdorado we ordered Grivel Air Tech Light crampons, a Mammut Togir Click harness, the Marmot Never Summer sleeping bag, Therm-A-Rest NeoAir Xtherm sleeping pad and Rab Endurance Down Mittens. All light and super warm, thank you! We can’t wait to put them in good use! 2 Comments	Cool new stuff! Last week we dropped our basecamp at Col du Midi, at an altitude of 3600m. Great for acclimatizing and preparing for our expedition! Due to new regulations we had to break down our tent every morning. Good training though! We climbed some steep ice, ridges and on the last day ventured up Mont Blanc (4808m). Exhausting but what a view, beautiful! For both of us a new altitude record. We can’t wait to climb Lenin Peak! 1 Comment	Back from Chamonix!